Dell to Release UP3214Q, UP2414Q, U2414H and U3415W? 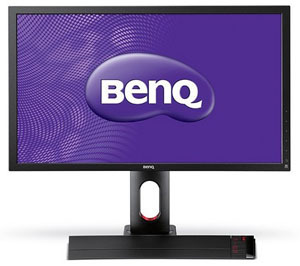 The latest update to BenQ's popular gaming monitor line up are the XL2411Z and XL2420Z (pictured). Following on from the XL2411T and XL2420T models the design from the outside remains basically the same, but things have changed internally. The main addition, like that seen on the recently announced XL2720Z model, is the "Motion Blur Reduction" feature. This integrated strobe backlight feature helps reduce perceived motion blur, like the third party results we saw when testing the LightBoost backlight system in the summer. This integrated solution can be easily accessed and turned on and off, and can apparently work on refresh rates between 75Hz and 144Hz. Useful if you cant consistently run at 144 fps and want to use the motion blur reduction at a lower refresh rate. Spec wise both screens offer a 1920 x 1080 resolution, 1ms G2G response time, 144Hz refresh rate support, 1000:1 contrast ratio, 350 cd/m2 brightness and 170/160 viewing angles. Both have a flicker free backlight, as with the reset of BenQ's new models and other popular gaming features like the Black eQualizer and wide range of 'Smart Scaling' options have remained thankfully. The panels are TN Film based and feature a W-LED backlight. Unlike the 11Z, the 20Z model includes touch sensitive buttons, a straight lower bezel design, red accents, a USB 2.0 hub and the S-switch extra for quick preset controls. The 11Z offers VGA, DL-DVI and HDMI connections, and the 20Z model is the same but with an additional HDMI included. No word on release date or price yet, but the 27" XL2720Z is expected to be released in January 2014 so these will probably be a few months behind. First leaked back in July, the forthcoming Dell U3415W is gathering a bit of pace now. 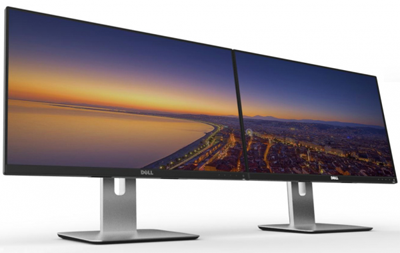 According to some sources the expected 34" screen will have an ultra-wide 21:9 format, like that of the Dell U2913WM model. It is expected to be aimed at graphics designers and those looking for the benefits of multi-monitor setups, but all from one screen. The resolution will apparently be 3440 x 1440 making it the same vertically as a 2560 x 1440 27" model, but quite a bit wider at the same time. The panel is expected to be IPS, as are most of Dell's top end screens nowadays. No real news on price or availability yet. While little official information is known at this time, Dell have also announced the forthcoming release of their new P2815Q screen. This will be a 28" sized model, and feature a 4k resolution which Dell aim to make it the most affordable ultra-HD resolution screen on the market. 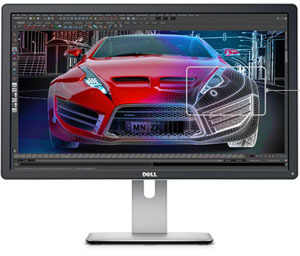 The Dell 28 Ultra HD Monitor will be available in early 2014. 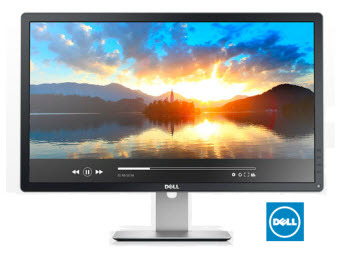 Offering the same incredible Ultra HD screen performance as the Dell UltraSharp 32 and Dell UltraSharp 24 Ultra HD Monitors, but priced at under $1,000, this 28-inch monitor can help boost user productivity with its multiple adjustability features, including the ability to pivot to portrait mode, plus multi-task applications. The energy efficient monitor has multiple input ports that allow users to display content from smartphones and tablets on the larger screen, and conveniently connect laptops, PCs and essential accessories. 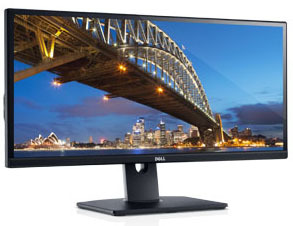 Dell expects this monitor will be the most affordable Ultra HD monitor in the industry when it is launched. Again more information and specs when we get them. 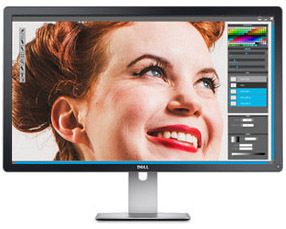 As we anticipated back in July, Dell have now formally announced a new 24" screen in their UltraSharp range. The UP2414Q will be the first 4k resolution 24" model available in the mainstream market, and marks an interesting boost in resolution for a smaller screen. We have already seen a steady influx of 4k resolution panels in larger formats, including Dell's own 31.5" UP3214Q model which we've discussed recently and is due for imminent release in the UK. The new 24" model features a 3840 x 2160 resolution and the highest pixel density to date in their range. The screen offers a wide gamut backlight covering 99% Adobe RGB and 100% sRGB, presumably using the new GB-r-LED backlight system like the U2413, U2713H and U3014 models. Like their other modern UltraSharp screens it comes factory calibrated with a dE of <2, offers 10-bit colour depth (unsure if using FRC or not) support and a programmable hardware LUT (with X-rite i1 Display Pro and Dell's own software, available separately). The stand offers tilt, swivel and height adjustments and there are HDMI, DisplayPort and mini DisplayPort connections available. There are even 4x USB 3.0 ports and a 6-in-1 card reader built in which are useful. 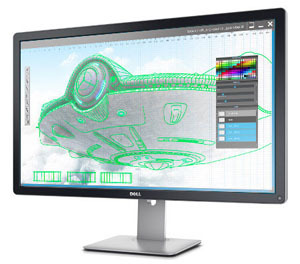 Dell haven't listed an official spec yet but some sources suggest this will be an IPS panel and offer an 8ms G2G response time, 1000:1 contrast ratio and 178/178 viewing angles. It is also reported to be released at a price of $1399 USD. More official information and spec confirmation as we get it. 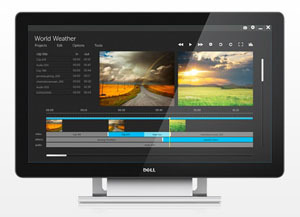 The eagerly anticipated Dell UP3214Q has now appeared on Dell.co.uk (UK). We've already brought you the official information about the large 31.5" UP3214Q earlier this month and the UK price from Dell direct is £2769.60 (inc VAT). We will feature reviews as soon as samples are available. The eagerly anticipated Dell U2414H and UP3214Q models have now appeared on Dell.com (USA). We've already brought you the official information about the large 31.5" UP3214Q earlier this month and the US price from Dell direct is $3499.99. We also brought you some early leaked information about the 23.8" U2414H at the end of October, and this is set to retail now for a very modest $349.99. In regards to the U2414H one area which is interesting that Dell are promoting on their website is the "World's thinnest border" to the screen which measures only 6.05mm. They even go as far as to say that the border is the bezel AND the black screen border, so it looks like this might be an accurate measurement here. UK prices have yet to be released. We will feature reviews of both models as soon as they are available. 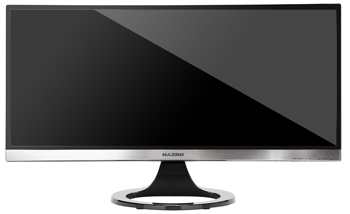 Hazro are set to release a new range of screens in sizes of 27, 29 and 30". These have yet to appear on Hazro's website but mark an updated range from their popular HZ27WA/C/D and HZ30Wi models we have reviewed in the past. All the new screens are IPS based as before. 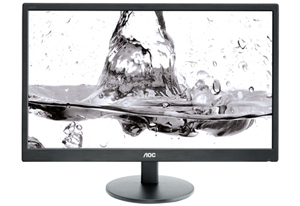 HZ27WiE - This model is glass fronted and features a 27" AH-IPS panel with 2560 x 1440 resolution. It also offers a 6ms G2G response time, 1000:1 contrast ratio, 440 cd/m2 brightness and 178/178 viewing angles. It is W-LED backlit and offers a 16.7m (8-bit) colour depth and sRGB gamut. There are DVI, DisplayPort, HDMI and VGA connections available. 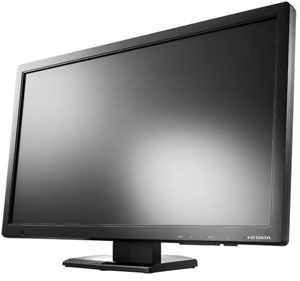 HZ29WiA - This is an ultra-wide model offering a 29" screen with 2560 x 1080 resolution. Again it's using an AH-IPS panel and offers an 8ms G2G response time 1000:1 contrast ratio, 300 cd/m2 brightness and 178/178 viewing angles. It is W-LED backlit and offers a 16.7m (8-bit) colour depth and sRGB gamut. There are DVI, DisplayPort, HDMI and VGA connections available. HZ30WiG - This is a wide gamut panel using a new GB-r-LED backlight system. IT offers a 30" screen size, AH-IPS panel and 2560 x 1600 resolution. It also offers a 6ms G2G response time, 1000:1 contrast ratio, 350 cd/m2 brightness and 178/178 viewing angles. It is GB-r-LED backlit and offers a 1.07b (10 bit) colour depth and wide colour gamut. This covers ~100% Adobe RGB. There are DVI, DisplayPort, HDMI and VGA connections available. The stand also offers tilt, height, swivel and rotate functions and there is even an integrated power 4 port USB 3.0 hub. No word on release date yet. Update 22/11/13 - pricing expected at launch will be HZ27WiE at £299, the HZ29WiA at £319 and the HZ30WiG at £699. All prices inclusive of VAT in the UK. There's been a fairly steady influx of 4k resolution panels into the monitor sector in recent months. Sharp's IGZO MVA panel has already been used in a few 31.5" size models like the Asus PQ321QE and upcoming Dell UP3214Q for instance. LG.Display are currently manufacturing a 31" 4k resolution IPS panel, although we haven't seen that used in any monitor yet. More recently we also brought you news about the Canon Reference DP-V3010 screen which is seemingly using a new 4k panel from Chi Mei Innolux. Not to be left behind, AU Optronics have recently started production of their own 4k panels. 4 modules are known at this time, 2 in the 27" sector and 2 in a 32" size. All four of these modules offer a 3840 x 2160 resolution and are based on AUO's recent AHVA (Advanced Hyper Viewing Angle) technology, designed to compete with the popular IPS panels produced by LG.Display. 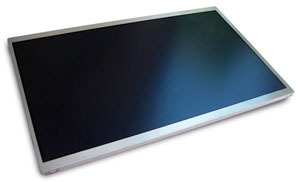 In fact we've already seen their 2560 x 1440 res 27" panel used in the BenQ BL2710PT. Some of the specs are not known at this time, but those that are known are shown below. There will be some differences separating the 1.0 and 1.1 versions of course, but unknown at this time. M270QAN01.0 and M270QAN01.1 - 27", 3840 x 2160, 1000:1 contrast ratio, 300 cd/m2 brightness, 178/178 viewing angles. 1.07b colour depth with 8-bit+FRC panel. W-LED backlight. M320QAN01.0 and M320QAN01.1 - 32", 3840 x 2160, 1000:1 contrast ratio, 350 cd/m2 brightness, 178/178 viewing angles. 1.07b colour depth with 8-bit+FRC panel. W-LED backlight. We have yet to hear of any monitors scheduled to use these panels but expect BenQ to be the first given their association with AUO. More information when we get it. We have also updated our panel parts database. 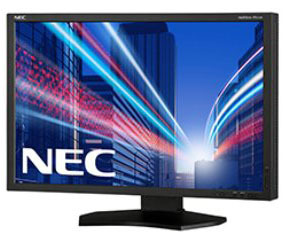 NEC have just added two interesting 27" models to their EA series of screens, aimed primarily at enterprise users. The EA273WMi is a 1920 x 1080 resolution model, while the EA274WMi offers a 2560 x 1440 resolution. Both feature AH-IPS panel technology and have a range of features aimed at office environments and the energy conscious. The EA273WMi offers a 1920 x 1080 resolution, 6ms G2G response time, 1000:1 contrast ratio, 250 cd/m2 brightness and 178/178 viewing angles. It is W-LED backlit with a 16.7m colour depth and standard sRGB gamut coverage. The EA274WMi is a little more interesting as it offers a higher 2560 x 1440 resolution. It also has a 6ms G2G response time, 1000:1 contrast ratio, 350 cd/m2 brightness and 178/178 viewing angles. It is W-LED backlit with a 16.7m colour depth and standard sRGB gamut coverage. On both models there are DisplayPort, HDMI, DVI-D, VGA 15-pin D-sub connections available and the stand offers tilt, swivel, height and rotate functions. 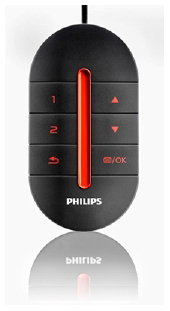 There are also integrated speakers, a 4 port USB hub, human sensor and ambient light sensor provided. We wouldn't normally delve into the world of very niche monitors like this, but we thought it was interesting nevertheless and deserved a mention. Eizo have today announced the release of the RadiForce RX650, a 30-inch colour LCD monitor ideal for multi-modality applications. The 6 megapixel screen of the RadiForce RX650 provides enough space to display numerous applications at once, making it an effective replacement for a dual 3 megapixel monitor setup. In addition, medical professionals can conveniently view images side-by-side without the obtrusive bezels typically found in a multi-monitor environment. The monitor gives users full control of the layout on screen to streamline the radiology workflow. To meet DICOM Part 14* international standards, EIZO carefully measures and sets each grey-scale tone on the production line for the most consistent shadings possible. 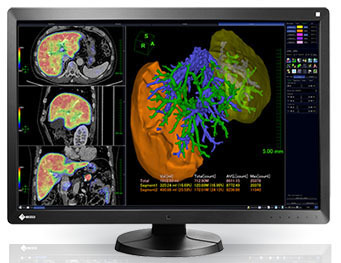 With the RadiForce RX650, both monochrome and colour images can be viewed at individually optimized brightness levels and tones using Eizo's Hybrid Gamma feature to expand the usability of multi-modality applications. Spec wise the 30" screen offers a 3280 x 2048 resolution, 30ms response time, 1000:! contrast ratio, 800 cd/m2 typical brightness and 176/176 viewing angles. It has an IPS panel with 1.07b colour depth from a palette of 68 billion. There are 2x DVI-D, 2x DisplayPort connections available along with a 2 port USB 2.0 hub. Canon aren't a manufacturer we see anything of in the desktop monitor world, but this new screen of theirs caught our eye. 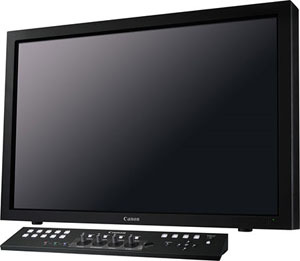 The Canon DP-V3010 4K Reference Display is designed to support image quality reviewing of 4K digital cinema or 4K UHD program material during all phases of origination and post-production. It is a 30" display with a true 4k resolution of 4096 x 2560. This is a 16:10 aspect ratio screen as well and features an IPS panel. Spec wise the panel also offers an RGB LED backlight, with a wide colour gamut. It supports most colour spaces used in digital cinema production: DCI-P3 (Digital Cinema Initiative is a joint venture major studios to establish a standard architecture for digital camera systems), Colour Gamut specifications of different broadcast standards (ITU-R BT.709, EBU and SMPTE-C) and the Adobe RGB colour space (Note: Adobe RGB does not contain all RGB colour saturation points). It supports a true 10-bit colour depth as well. The screen is not very bright though and has a "48 cd/m2 standard brightness (DCI)", while also listing 100 cd/m2. The screen apparently offers a "DCI compliant 2000:1 contrast ratio", and 178/178 viewing angles. The 30-inch display is only 7.4-inches deep and has convenient carrying handles that allow easy transportation on location, in the studio, or in a post-production suite. Applications of the reference display include on-set image evaluation, on-location "video villages", editorial, color grading, computer generated imaging (CGI), visual effects and animation. There are 8 (2 systems) BNC (75Ω) receptacle terminals and 4 DisplayPort (1 system, version 1.1a compliant) video inputs apparently. Keep in mind this is a very specific usage display for professional work. What interested us really was the arrival of a new 30" IPS panel with a 4096 x 2560 resolution, which perhaps we will start to see used in other screens at some point. Looking into it a bit more suggests this is probably using a new IPS panel from Innolux. Not really a manufacturer known for producing IPS, they do have a 30" panel with 4k resolution in the R300M1-L01 in production, although that is a CCFL unit. We expect there is also an RGB LED version as we are not aware of LG.Display (the main manufacturer of IPS panels) producing any of this size and resolution at the moment. The 31.5" sized screen offers a "4k" resolution of 3840 x 2160, four times the pixel area of a regular 1920 x 1080 display. The panel is based on Sharp's IGZO technology, an alternative to a-Si LCD panels which has been used in other 4k desktop monitors so far, like Sharp's own PN-K321 and the Asus PQ321Q. Other specs offer an 8ms G2G response time, 1000:1 contrast ratio, 350 cd/m2 brightness and 176/176 viewing angles. What makes this Dell model different to the Asus PQ321Q is the fact this screen supports a wide colour gamut, with a 99% Adobe RGB coverage (>100% sRGB). Adding to its focus as a professional range monitor, it comes factory calibrated with an average dE of <2. The panel offers 10-bit support with a 1.07b colour palette and you can also hardware calibrate the monitors LUT using an X-rite i1 Display Pro colorimeter and Dell's calibration software (like the recent U2413, U2713H and U3014 models). The screen is LED backlit, but presumably using an GB-r-LED backlight system to offer the wide gamut support. The stand provides tilt, height and swivel adjustments, but no rotate as surely that would be impractical at this size. There are HDMI 1.4, DisplayPort and Mini-DisplayPort video connections available, and there's also a 4 port USB 3.0 hub and 6-in-1 card reader. The screen hasn't officially appeared on Dell's UK or US websites, but the price listed on the link below is about $5400 USD (ouch!). More info on pricing and release date as we get it. 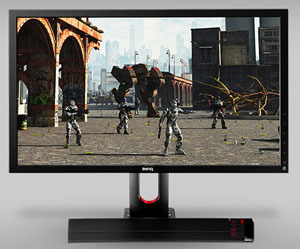 "The XL2720Z is the world's first professional gaming monitor to adopt Motion Blur Reduction, BenQ's latest technological innovation uniquely designed with the consideration of the resolution, response time and refresh rate of a monitor and how the three most crucial elements in determining a gamer's performance work together to achieve an ultra-smooth, blur-free gaming experience. For a long time, gamers have been reluctant to switch from CRT screens to regular LCD displays, being concerned with the delay in refresh rate, or the change of pixel colors from scene to scene, which for fast-paced FPS games would mean the difference between victory and defeat. With this technology, gamers would have the reaction time advantage they seek to make the perfect kill and compete or practice comfortably and confidently with improved vision quality. Motion Blur Reduction works to support a range of resolutions and refresh rates to provide cleaner, sharper video quality on the display." 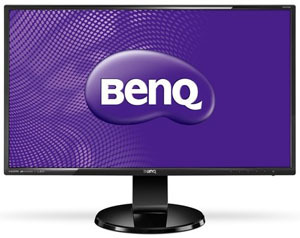 In addition to the new Motion Blur Reduction technology, BenQ have also equipped the screen with a flicker free backlight when controlling screen brightness (no need for PWM here), a "low blue-light mode" designed to make the screen more comfortable and a "Gaming Refresh Rate Optimization Management" (GROM) system. The new Low Blue Light technology, also introduced with the XL2720Z, is incorporated to provide gamers with top-notch vision condition that allows them to practice long hours or compete fiercely with clear, comfortable vision. The technology successfully manages the harmful blue spectrum light emitted from regular computer screens (from W-LED backlight units) through an offering of various adjustable low blue light level presets to help gamers better protect their eyes, as prolonged viewing may lead to eyestrain, eye damage and headaches. Game play can be clear and comfortable. The XL2720Z, like the award-winning XL2420T and XL2411T, offers gamers the freedom to custom-build their personal gaming computers with GROM, a management system that collaborates with the Display Mode and Smart Scaling feature to enable customization of viewing preferences, from refresh rates (100/120/144Hz), display resolutions to screen sizes. A highly personalized FPS gaming experience, more so than anything else, empowers gamers with an accurate sense of control, accuracy and ease. "The new XL2720Z and the industry-leading features that it comes with is a true and proud manifesto of our vision of professional gaming at its best and of our actions taken to realize that vision," said Peter Chen, General Manager of BenQ's Technology Product Center. "Motion Blur Reduction may yet to be a new concept to the gaming world, but no doubt it is the best-to-date perfection of LCD displays in gaming action. Gamers will find the clear difference we aim to deliver in game play clarity and fluidity once they get their hands on the XL2720Z." Spec wise the screen is 27" in size and offers a 1920 x 1080 resolution, 1ms G2G response time, 144Hz refresh rate support (max), 1000:1 contrast ratio, 300 cd/m2 brightness and 170/160 viewing angles. The screen is W-LED backlit and so offers a standard sRGB colour gamut. The panel is TN Film based as you might expect. The screen supports NVIDIA 3D Vision 2 with LightBoost as well. The screen also comes with all the gaming extras we have seen from previous BenQ gaming monitors. Things like Black eQualizer, a wide range of aspect ratio controls, the S-switch and FPS preset modes are present again here. There are D-sub, DVI, 2x HDMI and DisplayPort connections available. The XL2720Z will be available worldwide in November 2013. 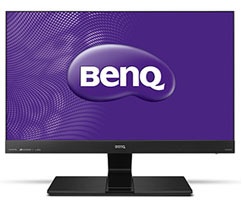 For more information, please visit www.BenQ.com and Gaming.BenQ.com. No word on price but we are sourcing a unit for review soon as well. 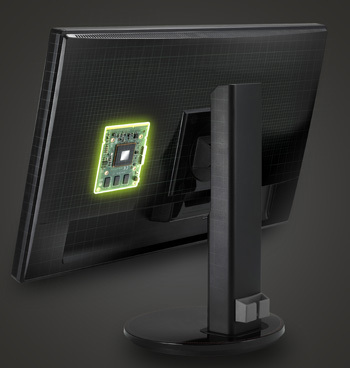 Eizo have just announced a very exciting development in the gaming monitor world. This market has been dominated for a while now by ultra-fast TN Film panels with very fast pixel response times, 120Hz/144Hz support and low input lag. Manufacturers have been concentrating on this technology to deliver improved frae rates thanks to the higher refresh rates, as well as offering support for 3D Stereoscopic gaming. More recently the third-party studies into NVIDIA's LightBoost backlight system have discovered impressive improvements to motion blur in 2D gaming thanks to their strobing backlight. In September we brought you the news of Eizo's new FDF2405W screen, designed for satellite imagery and a very niche market. What did interest us at the time was the use of a 120Hz compatible VA panel, a first in the monitor market in fact. This was the first move away from TN Film panels for 120Hz support. In addition it provided 240Hz support either through a frame doubling method, or by blinking the backlight on and off in between each normal frame. This was an interesting development given the motion blur reduction benefits we'd seen from LightBoost backlights, and it seemed Eizo had introduced their own official method in a similar way. While this screen seemed to spark interest with gamers, the retail price of this screen was very high and it wasn't designed with gaming in mind. 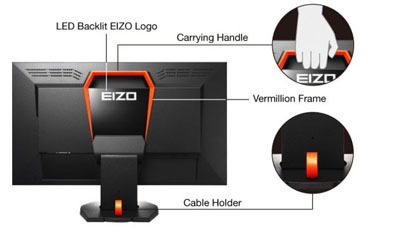 It was only a matter of time before Eizo did develop a proper gaming monitor based on a similar idea. The Foris FG2421 is that screen. It features an MVA panel from (correction) Sharp, but offers 120Hz refresh rate support for improved frame rates and gaming experience. A "Turbo 240Hz" feature allows the screen to operate at a pseudo 240Hz, with either frames being doubled or with a blinking backlight inserting a black frame between each frame to reduce perceived motion blur. 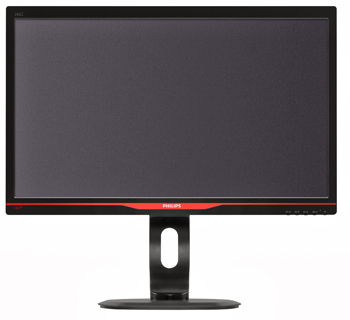 The latter method is most like the LightBoost backlight system we'd seen on other monitors, although it is an officially supported feature here from the FG2421. In theory this should offer some big improvements to the VA market when it comes to gaming, both with the increased frame rates from 120Hz refresh rate support, and from the motion blur reduction benefits of backlight strobing. The technology behind their Turbo 240Hz mode is explained in Eizo's whitepaper. This 240Hz mode should only be used for gaming as in normal desktop uses it leads to a visible flicker, as we have seen with LightBoost backlight systems as well. Eizo quote the screen as offering a 23.5" screen size, 1920 x 1080 resolution, sub 1ms response time (Turbo 240: ON, Monitor spec), 5000:1 static contrast ratio, 400 cd/m2 brightness and 178/178 viewing angles. The response time seems to be based on their 240Hz refresh rate method, and we suspect the actual pixel transitions could still remain somewhat of a bottleneck here given our experience with MVA panels before. They aren't as fast as modern TN Film panels and so it will be interesting to see the finished result from this screen. The contrast ratio is obviously much higher than anything offered by TN Film panels (typically 1000:1) and so this is a real advantage for a VA panel and can help ensure content in darker games is visible. Another positive for gaming is the fact that Eizo have focused on providing a low input lag here with their own integrated circuit. It's unclear what lag will be seen on this screen, although we know that LightBoost backlight systems can introduce additional lag. The whitepaper for Turbo 240Hz suggests the lag will be "a little more than 10ms" when using that mode, although we're not sure what the lag is without Turbo 240Hz active. It should be noted that the screen doesn't support 3D content despite the high refresh rate, and doesn't appear to be NVIDIA 3D vision certified. The screen also benefits from a hybrid backlight dimming system as we've seen from other recent Eizo screens. A Direct Current (DC) control is used for high brightness levels, so PWM is not needed and the screen shows no flicker (assuming you haven't enabled the deliberate flicker of the Turbo 240Hz mode). At lower brightness adjustments (we assume below 20% brightness as normal), PWM is used but at a high frequency, something Eizo refer to as Hi-PWM. The Whitepaper for the Turbo 240Hz feature suggests this operates at ~2000Hz it seems. The screen offers DisplayPort, DVI-D (HDCP) and HDMI interfaces. There is a 2 port USB hub and the stand offers height, tilt and swivel adjustments. You can also "Play like the pros" with gaming presets from pro gamers such as Counter-Strike legend Patrik “cArn” Sättermon and Dota 2 player Johan “n0tail” Sundstein. Use the bundled software, ScreenManager Pro for Gaming, to download these and other presets from gaming.eizo.com or to export your own presets. One other added feature is the rear cabinet design features an LED backlit EIZO logo on a glossy surface surrounded by a vermillion frame. The logo glows brilliantly in a dimly-lit room or in a tournament setting. The front cabinet has a simple design so you can focus on the screen. No word on release date or pricing yet, but Flatpanelshd have already managed to review the screen and it's well worth a read. We brought you some information about the forthcoming Dell U2414H in September, including some images and specs. As is pretty common for Dell, more bits and pieces are starting to appear on their website now. There is now a driver, outline drawing and user guide for the screen. We expect the actual product page to appear on Dell.com sites very soon. Studying the user guide confirms the screen spec has a 1920 x 1080 resolution, 8ms G2G response time, 2 million:1 dynamic contrast ratio, 1000:1 contrast ratio, 250 cd/m2 brightness and 178/178 viewing angles. The screen is W-LED backlight with an sRGB colour space (96%) and 16.7m colour depth (6-bit+FRC). It will offer a fully adjustable stand, along with DisplayPort, Mini DisplayPort and 2x HDMI (MHL) connections. Oddly there seems to be no DVI or VGA. There is also an integrated 4 port USB 3.0 hub. It sounds like the screen might come factory calibrated as well as the user guide talks about a dE of <4. The design and stand look very similar (the same?) as the P2414H model we tested recently. More info on availability and price as we get it, and of course a full review. Display specialist AOC launches three new 61 cm (24″) monitors in a 16:10 format. The 60 series models from the AOC Professional Line deliver a WUXGA resolution of 1920 x 1200 pixels, adding valuable desktop space in height compared to the widespread 16:9 Full HD format. Coming in a classy texturised black finish and different equipment variants, these high performers will provide for a great viewing experience in company and home offices. Users can also benefit from a number of tailor-made features such as integrated USB hubs, great ergonomics and intelligent software. The three new Pro Line models are targeted at office users at home or in enterprises, who require extra desktop real estate for working on complex tables, long texts or pictures. 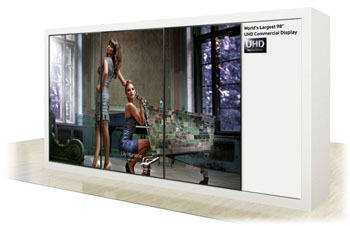 The two other models are the e2460Pxda and the e2460Sxda, which feature a 24" TN Film panel instead. They offer a 5ms response time, 1000:1 contrast ratio, 250cd/m2 brightness and 170/160 viewing angles. There are only VGA and DVI connections available, and no USB ports. The P model offers a fully adjustable stand, while the S model has only tilt available. The P model will cost £239.99 while the S model will cost £229.99. Lesser known Japanese manufacturer I-O Data are soon to release their new 27" MF275XPBR display. Availability will probably be limited but we thought we'd give it a quick mention nonetheless. The new screen uses Samsung's PLS panel technology to offer quality all-round performance comparable to the popular IPS technology which seems to dominate the market. Unlike a lot of the 27" PLS models we've seen to date, this screen offers only a standard 1920 x 1080 resolution. In terms of other specs there is apparently an 8.3ms G2G response time, with 15ms quoted as the ISO response time. Odd figures for a response time spec really. Other than that there is a 1000:1 contrast ratio, 300 cd/m2 brightness and 178/178 viewing angles. DVI, HDMI and VGA connections are provided and there are also integrated speakers. The screen is reportedly going to be available in Japanese markets mid November. No word on price yet. Iiyama have recently announced the release of four new 83 series screens in their range. Available in 24" and 27" sizes the X2483HSU / XB2483HSU and X2783HSU / XB2783HSU feature the latest AMVA+ panel technology. This latest generation of AMVA from AU Optronics can offer the high static contrast ratios we've become accustomed to, with a spec here of 3000:1. The panel offers a true 8-bit colour depth as well, and hopefully we will see similar viewing angle improvements as we did on the BenQ GW2760HS when we tested that recently. In terms of other specs they all offer a 1920 x 1080 resolution, 4ms G2G response time and 178/178 viewing angles. The only difference between the X and XB versions is that the latter have height and pivot adjustment from the stand, whereas the former only have a basic tilt adjustment stand. For connectivity they offer HDMI, VGA and DVI ports, and there are also 2x USB connections and integrated speakers available. We have recently been given confirmation from BenQ about their full flicker-free range which is now available. You may notice that some of the screens listed below were previously available, but have not been developed to be flicker free. Models which previously used Pulse Width Modulation (PWM) for backlight dimming have now been converted to using a Direct Current (DC) backlight control instead, eliminating any monitor flicker and associated side-effects which some users suffer from. This is a welcome change we're sure readers will agree, and signifies a mass update to their range to meet the demands of buyers who are becoming increasingly aware of the issues associated with the use of PWM. Where models have been updated the actual product name has not been changed, but buyers can recognise the new flicker free version by the part number (P/N) shown below. From a manufacturing point of view the change was made during July and August and so new stock supplies should in theory be of the new flicker free version (although not guaranteed). Buyers should check with stockists for the P/N they have in supply to be sure which version they will be receiving. 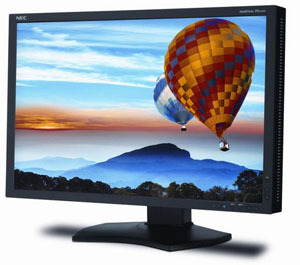 Monitors typically operate at a fixed refresh rate, whether that is 60, 120 or 144Hz. When running graphically intense content like games, the frame rate can of course fluctuate somewhat and this poses a potential issue to the user. There are currently two main options available for how frames are passed from the graphics card to the monitor using a feature called VSYNC. At the most basic level ‘VSync off’ allows the GPU to send frames to the monitor as soon as they have been processed, irrespective of whether the monitor has finished its refresh and is ready to move onto the next frame. When the frame rate of the game and refresh rate of the monitor are different, things become unsynchronised. This lack of synchronisation coupled with the nature of monitor refreshes (typically from top to bottom) causes the monitor to display a different frame towards the top of the screen vs. the bottom. This results in a distinctive ‘tearing’ on the monitor that really bothers some users. Even on a 120Hz or 144Hz monitor, where some users incorrectly claim that there is no tearing, the tearing is still there. It is generally less noticeable but it is definitely still there. The solution to this tearing is the ‘VSync on’ option which essentially forces the GPU to hold a frame until the monitor is ready to display it, as it has finished displaying the previous frame. It also locks the frame rate to a maximum equal to the monitor’s refresh rate. Whilst this eliminates tearing, it also increases lag as there is an inherent delay before frames are sent to the monitor. On a 120Hz monitor the input lag penalty is half that of a 60Hz monitor and on a 144Hz monitor is even lower. It is still there, though, and some users feel it disconnects them from game play somewhat. When the frame rate drops below the refresh rate of the monitor this disconnected feeling increases to a level that will bother a large number of users. Some frames will be processed by the GPU more slowly than the monitor is able to display them. In other words the monitor is ready to move onto a new frame before the GPU is ready to send it. So instead of displaying a new frame the monitor displays the previous frame again, resulting in stutter. 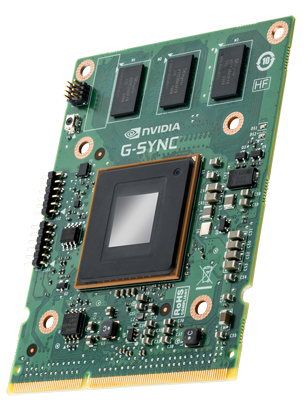 To overcome some of these limitations with Vsync, NVIDIA have just introduced a new technology they have dubbed G-sync. This technology can be integrated into monitors to allow them to adopt a variable refresh rate, dynamically altering the monitor depending on the graphics card output and frame rate. The frame rate of the monitor is still limited in much the same way it is without G-SYNC, but it adjusts dynamically to a refresh rate as low as 30Hz to match the frame rate of the game. By doing this the monitor refresh rate is perfectly synchronised with the GPU. You don’t get the screen tearing or ‘visual latency’ of having Vynsc disabled nor do you get the stuttering or input lag associates with using Vynsc. G-sync will only work over DisplayPort at the moment as it relies on its data packet capabilities. The module will apparently lock off access to any other port (HDMI, DVI etc.) and audio via DP capabilities. To use G-SYNC you need a compatible monitor and GPU. On the GPU side that’s any Nvidia GPU that’s a GeForce GTX 650 Ti Boost or ‘higher’ – this is a proprietary Nvidia technology and is not compatible with AMD GPUs. On the monitor side there is a DIY modification kit for use with the ASUS VG248QE which will be available for around $175 (USD) by the end of 2013 – although Nvidia hopes to chop the cost down to around $130 if possible. Installation will apparently be a simple 20-30 minute job using a Phillips screwdriver. It isn’t clear whether this kit will be available locally outside of the US, for example in the UK. Modified VG248QEs with the technology built into them will also be available from popular retailers at an RRP of $399. The most pleasing news is that some of the major monitor manufacturers are extremely excited about this technology. ASUS, BenQ, Philips and ViewSonic will all be releasing G-SYNC ready PC monitors during 2014, which should be available internationally. It is not restricted to 120Hz/144Hz TN panel models either. Some of the models will have 2560×1440 and even 3840×2160 (‘4K’) resolutions, implying integration with IPS and IGZO technologies as well. Whilst G-SYNC can provide a smoother experience by eliminating tearing, reducing stuttering and decreasing latency it does not affect motion blur caused by either the movement of our own eyes or the pixel responses of the monitor. We have already written an in depth article about the motion blur reduction benefits of using a strobed LightBoost backlight system for 2D gaming, something which seems to be gathering pace and interest. When asked if the technology can be used alongside LightBoost and particularly the forced 2D activation Nvidia’s Andrew Burnes stated: “We have a superior, low-persistence mode that should outperform that unofficial implementation, and importantly, it will be available on every G-SYNC monitor. Details will be available at a later date.”. This implies that there may be some sort of blur-reducing mode (perhaps backlight strobing like LightBoost) in the works that could be activated in the driver on these new G-sync enabled monitors. Whether at the same time or as an alternative remains to be seen. Either way it is potentially very exciting, especially seeing as some of these monitors will be 2560 x 1440+ IPS parts. 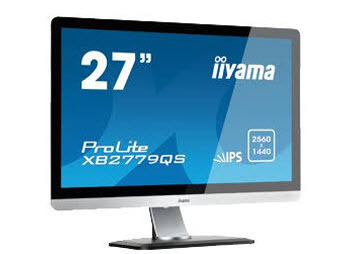 Iiyama have recently released a new 27" IPS based model to the market, the XB2779QS. This screen offers a 27" screen size with 2560 x 1440 resolution, providing an interesting alternative to popular models like the Dell U2713HM, Asus PB278Q and ViewSonic VP2770-LED for instance. The screen offers a 2560 x 1440 resolution, 5ms G2G response time, 1000:1 contrast ratio, 440 cd/m2 brightness and 178/178 viewing angles. The screen is W-LED backlight, offering a standard colour gamut (sRGB) and 16.7m colour depth. There are VGA, DVI, HDMI and DisplayPort connections available and the screen has integrated 2x 2W stereo speakers as well. The stand offers tilt, height, swivel and rotate adjustments as well. The screen is available now at an attractive price of £432 GBP (inc VAT). 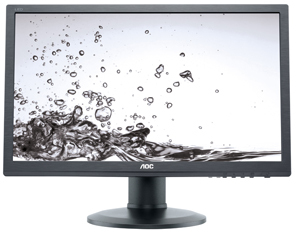 AOC have just added a new model to their 'Professional' line-up, the 23.8" widescreen i2470Swq. This model is based on the same AH-IPS panel as the recently tested Dell P2414H and the recently released Asus VN248H. It features a 1920 x 1080 resolution, 6ms G2G response time, 1000:1 contrast ratio, 250 cd/m2 brightness and 178/178 viewing angles. Connections wise there are VGA, DVI, DisplayPort and HDMI inputs but the stand offers just a basic tilt adjustment. No word on price or availability yet. As we discussed back in July, Dell seem to be gearing up to launch a new line-up of screens in their extremely popular UltraSharp range. Some more information has emerged about one of the new models, the U2414H. As we predicted, this looks set to be a 16:9 aspect ratio screen (indicated by the "H" in the model name) and will offer a 23.8" panel, presumably the same as that used in the recently launched P2414H (which we are reviewing at the moment). This LG.Display AH-IPS panel will offer a 1920 x 1080 resolution, 8ms G2G response time, 1000:1 contrast ratio, 250 cd/m2 brightness and 178/178 viewing angles. It uses a W-LED backlight system and so will offer an sRGB gamut (~96%), and its colour depth is 16.7m through a 6-bit+AFRC panel. There are HDMI (with MHL support), DisplayPort and mini DisplayPort connections available, along with a four port USB 3.0 hub. The stand will offer a full range of tilt, height, pivot and rotate functions. It appears that the screen will offer a very slim bezel which reportedly measures only 6.05mm, and according to the images there doesn't appear to be any additional inner border around the image, although it remains to be seen if that is a realistic representation as other manufacturers have been a bit sneaky with this before. The stand is a new silver colour which we have also seen from the P2414H and it appears the screen will have touch-sensitive buttons like the other new UltraSharp models of recent times. The screen will apparently be launched in December at a retail price of $370 USD. ViewSonic are set to launch a new model in their VP series. 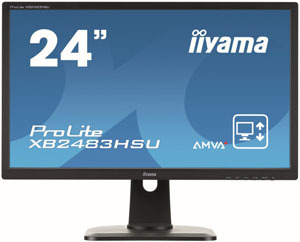 The VP2772 is a 27" IPS based screen boasting a 2560 x 1440 resolution. What sets this apart from their VP2770 screen is the use of a GB-r-LED backlight system offering Adobe RGB gamut (99%). The screen also offers support for 10-bit content along with a 12-bit colour engine and 14-bit LUT. The screen also comes factory calibrated apparently with a dE of <3. Spec wise the VP2772 offers a 12ms response time, 1000:1 contrast ratio, 350 cd/m2 brightness and 178/178 viewing angles. The specs actually talk about a "White-LED backlight" but this must presumably be a typo as given the colour gamut coverage and the IPS panel, this is presumably using the same LG.Display LM270WQ3 panel as models like the Dell U2713H. The screen sports HDMI, DisplayPort, mini DisplayPort and DVI inputs along with an 4 port USB 3.0 hub. The stand offers tilt, height, rotate and swivel adjustments. The screen is expected to go on sale mid October at a retail price of ~$999 USD. LG.Display are currently manufacturing a new 31" panel in their desktop line-up. The LM310UH1-SLA1 will offer a massive 4k resolution, rivalling Sharp's 31.5" ASV IGZO panel which is currently dominating the market place as the main choice for ultra HD screens (Asus PQ321Q, Sharp PN-K321 and Dell's forthcoming UP3214Q as far as we know). In fact this new LG.Display panel will offer a true 4k with a 4096 x 2160 resolution as compared to the 3840 x 2160 res of the displays already mentioned using Sharps IGZO panel. Also unlike Sharps offering, this LG.Display panel will be a-Si instead of IGZO, and will be based on their popular IPS panel technology. In terms of other specs, the panel will offer a 1000:1 contrast ratio, 450 cd/m2 brightness, 178/178 viewing angles and 1.07b colour depth (10-bit). The backlighting system is GB-r-LED and so will offer a wide gamut coverage. Response time is currently not listed on the preliminary panel spec sheet. We expect this panel to be adopted by manufacturers for their displays in the near future as the competition hots up in the 31"+ 4k sector. We have added the new panel to our Panel Parts Database as well. Hot on the heels of their new P series screens, and the forthcoming UltraSharp range updates, Dell have also just released some new touch screens in their range. With full Windows 8 certification and a projective capacitive (highly sensitive) touch system featuring recognition of 10 simultaneous touch points, the monitors are designed to offer a seamless interactive experience. Spec wise they are available in two sizes, 23" and 27" as the model names indicate. Both have a glossy screen coating and use AH-IPS panels from LG.Display with a 1920 x 1080 resolution. They also offer an 8ms G2G response time, 1000:1 contrast ratio, 270 cd/m2 brightness and 178/178 viewing angles. They are W-LED backlit and so offer a standard sRGB gamut. The stands offer an impressive 60 degree tilt adjustment so that it can be used more like a tablet if required, low to the table. The display is also VESA 100 compliant if you'd rather do away with the stand. There are VGA, DisplayPort and 2x HDMI (with MHL support on one) available along with 2x USB 3.0 ports. The monitors are now available in the United States for around $400 (23”) and $620 (27”). They are also available in the United Kingdom for around £370 (23”) and £550 (27”) including VAT and for a similar price in various European countries. For users who prefer something a bit smaller, cheaper and less showy there is also a 20” model called the E2014T with TN panel and 1600 x 900 resolution available for around $230 (£220 when launched in the UK on September 26th). 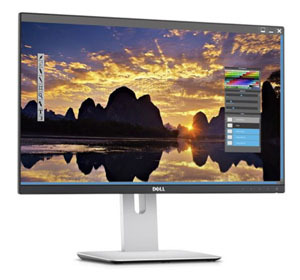 Dell have recently revamped their Professional P series of screens, which have been somewhat overshadowed in the past by their UltraSharp range. The new 2014 range have been updated however to move away from the more basic TN Film panels, and now sport the latest generation of AH-IPS technology from LG.Display and W-LED backlights. There are 4 new models being launched, the 21.5" P2214H, 23" P2314H, 23.8" P2414H and 27" P2714H. 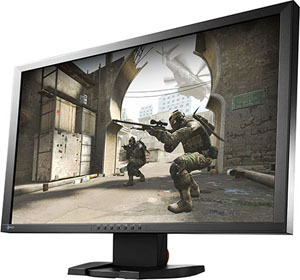 All models offer a 1920 x 1080 resolution, 8ms G2G response time and 178/178 viewing angles. The 27" model has a 300 cd/m2 brightness whereas the other three have 250cd/m2 in their spec. They are all W-LED backlit and so offer a standard sRGB gamut. All models offer a fully adjustable stand with tilt, height, pivot and rotate adjustments available. They all feature 1 DisplayPort 1.2a output, 1 DVI-D output and 1 VGA output. There is no HDMI to be found on these and no audio inputs or outputs such as a headphone jack or speakers either. There are also 3 USB 2.0 downstream ports (plus one upstream) which some users will find useful. On all models the fully adjustable stand can be removed and an alternative 100 x 100mm VESA-compatible stand or mount used instead. 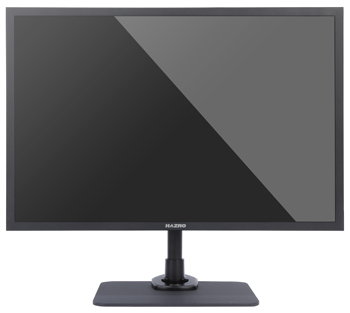 25/9/13 Correction: The P2414H is technically a 23.8" sized screen, not 24"
Eizo have recently updated their DuraVision range of monitors with the 23.5" FDF2405W. On the face of it you might think this was a screen aimed at gamers, but it's not. Instead it's designed to display satellite imagery and is a fairly unique piece of kit. Because of this there are no super-thin bezels, glossy plastics, glossy panel coatings or other stylish features that you might expect from many modern monitors. It's a fairly unassuming design in fact. What is of interest though to more mainstream users, and sparked our interest too, is that it features an AMVA panel with true 120Hz signal input – a world first for a monitor. The monitor also uses 240Hz panel drive (frame doubling) to internally convert a 120Hz input signal into a pseudo-240Hz output for a smoother motion appearance. *1 This monitor converts 120 Hz input signals into 240 Hz within the panel, and doubles the refresh rate to draw two images per frame. By applying a voltage higher than the input signal to speed up response (overdrive) for the first image, and then drawing the second image with the original input signal, the liquid crystals are stabilized. The “Blur Reduction” function turns on the backlight only for the stable duration of the second image, and off for other durations. This means no interpolation is used, so no input lag from interpolation! The Eizo “240Hz” monitor achieves 240Hz via a two-pass refresh. One overdriven refresh in the dark, unseen by the human eye, followed by a single backlight strobe flash on a very clean 120Hz refresh. Although this model is targeted at GIS/mapping, this could potentially become an decent casual-gaming 120Hz monitor potentially with improved motion blur performance. How it performs in practice remains to be seen, and it will be interesting to see if the VA panel can really provide fast enough pixel transitions to offer a truly impressive gaming performance. The monitor is equipped with a 3-pin mini-DIN connector using a 120 Hz signal so you can display 3D content. It utilizes an active shutter 3D system that synchronizes the high-speed refresh rate of the monitor with the signal from 3D glasses to produce 3D images. IR emitter, 3D glasses, and graphics board supporting 120 Hz are required to view 3D content. Spec wise the screen is 23.5" in size, offering a 1920 x 1080 resolution, 4ms G2G response time, 5000:1 contrast ratio, 450 cd/m2 brightness (without motion blur reduction turned on) and 176/176 viewing angles. The panel can reportedly support 1.07b colours through 10-bit content (via DisplayPort) and a 3D LUT. 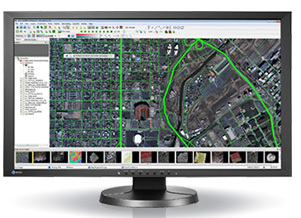 Defined by the National Geospatial Intelligence Agency, EPD (Equal Probability of Detection) gamma displays subtle variations in tones more clearly in undefined areas and distinguishes flat terrain in satellite images. The EPD preset mode ensures that each gradient step between black and white can be detected and defines objects and details that would otherwise remain difficult to see. There are a full range of ergonomic adjustments available from the stand with tilt, height, pivot and rotate. There are 2x USB 2.0 ports and for video there are DVI and DisplayPort available (with HDCP). No word on availability or price yet. With a few recent models released by Asus, Dell and Sharp, the 31.5" 4k resolution market seems to be filling up nicely. Samsung showcased their 3840 x 2160 resolution screen at the IFA show this year although we're not sure what the model number is at the moment. There's not much in the way of official information but it's very likely this will use the same Sharp IGZO ASV panel as the other models. The screen is 31.5" in size and we do know that it offers an LED backlight unit. Some press reports seem to suggest that it has an Adobe RGB coverage of 99% which would imply that it is a wide gamut model. This is a little confusing since the panel used in the Asus/Dell/Sharp models is sRGB only. Perhaps this is a different panel, or perhaps there's been some confusion and the colour space is actually 99% sRGB. When more official information emerges we will know for sure. We do know there are tilt and rotate adjustments from the stand along with 4x USB ports, HDMI, DL-DVI and DisplayPort connections. The screen is factory calibrated and offers a 10-bit colour depth apparently. No official word on price or availability yet, but expect it to be high like the other models. 25/9/13 Update: We are informed that Samsung will be presenting the final version of this screen at CES 2014. They told visitors at IFA 2013 that the screen was indeed 99% Adobe RGB and that other specs were still being finalised. Not one for ever coming up with simple, easy to remember model names, Philips have recently launched their new 24" gaming screen, the 242G5DJEB/00. This TN Film based model offers a 1ms G2G response time and supports refresh rates up to 144Hz. Spec wise the screen offers a 1920 x 1080 resolution, 1000:1 contrast ratio, 350 cd/m2 brightness and 170/160 viewing angles. There is no talk in the press release about the screen being NVIDIA 3D vision compatible so this could well be another high refresh model, without 3D support and without a LightBoost backlight system by the look of things. The gaming screen comes with a few fancy features. These include the so-called "SmartKeypad", a specially designed remote control provides quicker access to gaming pre-sets. Additional up and down function keys allow users to navigate the OSD menu quite easily. There is also a "SmartFrame" feature available from the OSD menu, which highlights areas in which users can spot their opponents more easily by boosting the gain level of RGB in the selected area. The "SmartSize" option allows you to control the aspect ratio and screen view as well. Connection wise the screen has VGA, DL-DVI, DisplayPort and HDMI. MHL is also supported and the screen has an integrated USB 3.0 hub. A full range of tilt, height, pivot and rotate adjustments are provided by the stand. Details of a couple of new 27" panels from AU Optronics have recently emerged, following on from the news we brought you back in December 2012 that they were working on some 2560 x 1440 parts. These new modules will use AHVA panel technology which is "IPS mode", designed to offer similar performance characteristics to IPS/PLS technologies. Interestingly there are two panels in production now which are the M270DAN01.0 and M270DAN01.1. Both offer a 2560 x 1440 resolution, 12ms G2G response time, 1000:1 contrast ratio, 350 cd/m2 brightness and 178/178 viewing angles. The 1.0 version is W-LED backlit and offers a 16.7m colour depth (8-bit), while the 1.1 version offers a wide gamut from a GB-LED backlight system and 1.07b colour depth (8-bit+FRC). BenQ have already announced their first screen to use one of these new panels, the BL2710PT which will presumably be using the 1.0 version of the panel since it's advertised as a W-LED standard gamut model. A wide gamut model will no doubt follow at some point we expect. These new panels have been added to our comprehensive panel parts database. Samsung have just announced an interesting new model in their range, featuring an AD-PLS panel and a super-thin bezel design. The 27" AD-PLS panel offers a 1920 x 1080 resolution, 5ms G2G response time, 1000:1 contrast ratio, 300 cd/m2 brightness, 178/178 viewing angles, 6-bit+FRC colour depth and a W-LED backlight offering sRGB gamut. There are connections for HDMI, VGA and audio output on the back, and the stand offers only a basic tilt adjustment (no VESA mounting options). "Every Monitor produces a strain of blue spectrum light that is one of the critical causes of eye damage, eye strain, headaches and sleeping disorders. 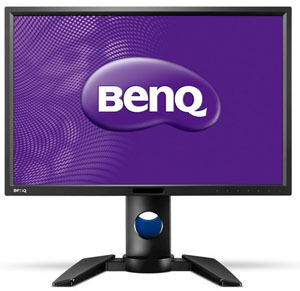 BenQ’s unique Low Blue Light technology is designed to deal with the everyday problem of blue light exposure and allows a healthier time spent in front of your computer. Switch to one of the four preset Low Blue Light Modes from OSD hot key (Multimedia – 30% reduction, Web-surfing – 50% reduction, Office – 60% reduction, Reading – 70% reduction), and reward your eyes without having to lose the visual enjoyment." This is basically a range of preset modes with a warmer white point to eliminate some of the blue dominance, particularly problematic on W-LED backlights but overall not a huge problem for users to be honest. The 24" EW2440L is pictured with a very thin bezel, but it is not clear whether there is some marketing trickery going on here, and in fact there is a larger bezel around the panel as well, like we've seen on other "ultra slim bezel" screens in the past. Time will tell. It offers an AMVA panel with 1920 x 1080 resolution, 4 ms G2G response time, 3000:1 contrast ratio, 250 cd/m2 brightness, 178/178 viewing angles, 8-bit colour depth and a W-LED backlight offering 72% NTSC colour gamut (sRGB). There are d-sub and 2x HDMI connections available, one of which supports MHL as well. There is a simple tilt adjustment from the stand only. 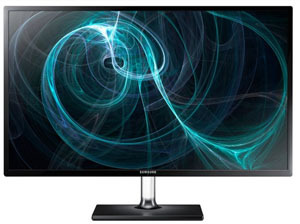 The 27" EW2740L offers a very similar spec as the 24" models, except it offers a 300 cd/m2 brightness. No word on price or availability yet. Both models have already been added to our Flicker Free Monitors Database. Hot on the heels of the news we brought you 2 weeks ago about the new 24" PA242W (pictured in the absence of images of the 27" or 30" models), NEC have just announced plans to release a new 27" and 30" model in their popular PA series. The new PA272W and PA302W will feature AH-IPS panels, and now move to the modern GB-LED backlighting as well. This maintains the wide gamut support of the previous PA series models (PA271W and PA301W) but allows for energy and environmental benefits. With the use of GB-LED backlighting, the screens can offer Adobe RGB colour space coverage and offer 10-bit colour support as well. More spec detail when we have it available but expect the usual hardware calibration support, ColorComp uniformity correction etc. Suitable for applications where accurate colour, consistent imaging and reliable viewing is necessary such as satellite imaging, video and photographic editing, precision engineering and broadcasting, the monitors offer a discrete but robust design with a fully ergonomic stand for added comfort of use during long and intensive working periods. The NEC MultiSync PA242W will be available from August 2013 onwards. The NEC MultiSync PA272W and PA302W will be available to purchase from September 2013. Pricing is unknown at this time. LG are set to release two new ultra-widescreen, 21:9 aspect monitors in their range, to complement their existing 29EA93 and 29EB93 models. The new 29EA73 and 29EB73 both appeared recently on LG Australia's website, and at first glance not a lot appears to have changed apart from some minor adjustments to the stands. The EA model features a fixed stand designed more for home users, while the EB model offers a height-adjustable stand and is aimed at more demanding users. The back of the screen is now black, while the EA93 range had a white back. The specs for both models are the same with a 29" AH-IPS panel offering a 2560 x 1080 resolution, 5ms G2G response time, 178/178 viewing angles, 8-bit colour depth, W-LED backlight and 99% sRGB coverage. The screen has a light AG coating like other recent IPS panels thankfully. The screens even come factory calibrated, and also offer hardware calibration support through their 'True Color finder' software and a compatible colorimeter. There are DVI, 2x HDMI (one supporting MHL), DisplayPort and 2x USB 3.0 / 1x USB2.0 connections available. The screen also comes with integrated 7W stereo speakers and audio input/output connections. 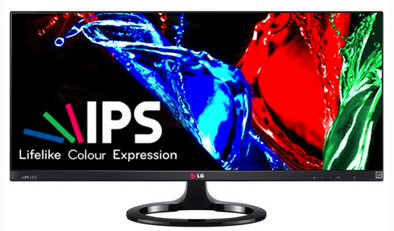 At the moment the monitors are listed on a few regional LG websites including LG Australia. They have an RRP of $749 AUD which just undercuts the RRP of the ‘93’ models by $50. Global availability and prices are expected shortly. As we predicted the other week, some more information has emerged now about the new 32" monitor Dell is planning to release in their UltraSharp range. The model is expected to be called the UP3214Q, and by the look of things the "4" represents the fact it's part of their 2014 line-up (indicating it will be released before the end of 2013), and the "Q" probably represents "Quad HD". This provides further excitement about the planned UP2414Q which looks like it could well be a 24" panel with 4k/Quad HD resolution. More on that model when we get it. The UP3214Q will offer a massive 3840 x 2160 resolution and is based on a Sharp IGZO panel, which at this time, is the only readily available panel in this size offering this kind of spec. 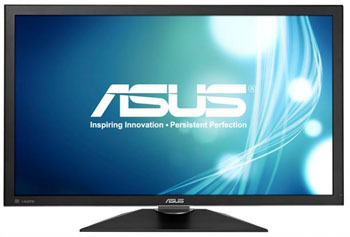 It is the same being used in Sharp's own 32" monitor, and also in the Asus PQ321Q. The monitor has DisplayPort, Mini DisplayPort and HDMI connections and also an integrated USB hub and card reader on the left hand side. The screen looks very similar to other recent Dell UltraSharp models, although the stand is now aluminium, but still offers a full range of tilt, height, swivel and pivot adjustments. The screen will apparently be available in the fourth quarter of 2013 but not price tag has been given yet. There isn't really any other information available yet, but we would guess from the model names that the UP3214Q is likely to be a 31.5" 4k resolution screen similar to the Asus PQ321Q we discussed recently. It would seem logical that Dell should release a rival screen to that from Asus, which has recently gone on pre-order at £2999.99 GBP in the UK. The UP2414Q and U2414H look like they will be 24" models. The U2414H looks like it may be a 16:9 format screen perhaps as the "H" suffix is normally used to signify those 16:9 aspect models (e.g. U2713H, U2713HM). The absence of the "M" suffix though might suggest this is a higher end model with an 8-bit panel (maybe 10-bit support?). It might also perhaps be a model using a newly released LG.Display 23.8" panel (listed in our panel parts database), which offers a 16:9 aspect ratio and 1920 x 1080 resolution, but remains classified as 24" by other manufacturers. This is all speculation but again it seems logical. Finally the U3415W looks like maybe it will be a 34" model perhaps, something certainly bigger than we've seen before although there aren't really any obvious competitors to this, or panels which seem to make sense. More information on them all as we get it of course. NEC are set to update their PA series of screens, this time with a new 24" model using the latest GB-LED backlighting technology. Like the Dell U2413, this allows for a wide gamut colour space (99.3% Adobe RGB) while bringing about power, size and environmental benefits when moving away from older WCG-CCFL units. NEC already have a standard gamut model, the P242W, available, but this is the upgrade to their PA wide gamut series. The 24" screen offers a 1920 x 1200 resolution, 8ms G2G response time, 1000:1 contrast ratio, 340 cd/m2 brightness and 178/178 viewing angles. The AH-IPS panel should have the latest light AG coating as well. It has a programmable 14-bit 3D LUT and 10-bit colour processing from the panel. The hardware calibration can be accessed using NEC's SpectraView II software and an X-rite i1 Display Pro. We expect that the usual European pattern will follow where the screen works instead with the SpectraView Profiler software, but only if you have bought the specific "SpectraView" or "Reference" edition of the screen. The screen also offers a full range of tilt, height, pivot and rotate adjustments from the stand and is equipped with DisplayPort, DVI-D, HDMI and VGA video connections. There are 3 USB ports, and an ambient light sensor. The screen is expected to retail for $1049 USD for the screen, or $1299 for the screen packaged with calibration device and software. 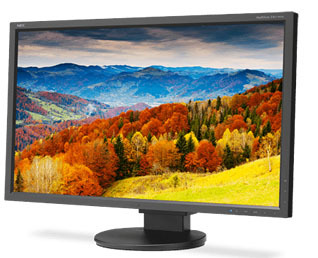 Sharp Corporation will introduce into the Japanese market a new 32-inch-class LCD monitor, the PN-K322B. This professional-use monitor features an originally developed high-sensitivity, high-precision touch-screen and delivers 4K resolution (3,840 × 2,160 pixels)—a level of resolution four times that of full HD. 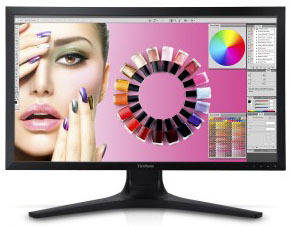 The PN-K322B is Sharp's latest ultra-high-definition display. Its high-precision touch-screen allows accurate onscreen handwriting of fine text and lines, with writing performed via a dedicated touch pen with a pen-tip width of just 2 mm. The display also supports multi-touch operation. Thanks to their new "IGZO" panel technology and an edge-lit LED backlight, the PN-K322B boasts a slender profile with a thickness of just 36 mm - the thinnest in its class. An included stand allows the monitor to slide easily between two angles depending on the application: vertical for viewing the monitor or low-angle for onscreen writing and touch-screen operation. The PN-K322B features a palm cancellation function that prioritizes pen input even when the user's hand is resting on the touch-screen. Input connectors on the PN-K322B are compatible with the latest DisplayPort and HDMI interface specifications, enabling the monitor to display 4K ultra-HD content delivered from a PC via a single-cable connection. DisplayPort (Multi-Stream Transport) supports up to 3,840 × 2,160 resolution at a 60p frame rate; HDMI port can support up to 3,840 × 2,160 resolution at a 30p frame rate. Demand for ultra-high-definition 4K displays is growing for numerous business and professional applications such as graphic and video content creation and editing. To further grow demand for 4K displays, Sharp will propose usage applications in other fields too, such as in customer service applications at retailers and showrooms or in exhibition displays at museums and art galleries. Spec wise the 32" class (i.e. 31.5" sized) screen offers 10-bit colour support (1.07b colours) and 300 cd/m2 brightness according to Sharp's press release. Expect other specs similar to the recently announced Asus PQ321Q. The screen is apparently going to be available at the end of the month in Japan. No word on other release dates elsewhere, or price. 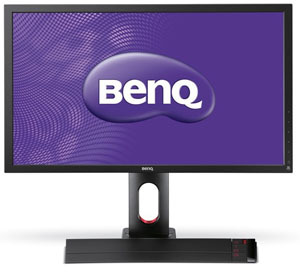 BenQ have unveiled a new 24” gaming monitor at the MLG (Major League Gaming) Spring Championship in California, an event that ran from June 28th until June 30th. The screen remains very similar to the existing XL2420T model, but there are a couple of key changes. First is the use of a flicker free backlight, a move BenQ have made for most of their new range of screens and certainly one which is welcome. Secondly the refresh rate has been bumped up from 120Hz to 144Hz now (much like they did with the XL2411T in fact), and there is now a quoted 1ms G2G response time from the screens TN Film panel. The screen retains the same 1920 x 1080 resolution, 350 cd/m2 brightness, 170/160 viewing angles from before. Other gaming features including Black eQualizer and Smart Scaling are provided still and the design is the same as before. Overall the screen seems to bring the best bits from the existing XL2411T and XL2420T models, and combines them with a new flicker free backlight. The screen also supports LightBoost for NVIDIA 3D vision so there are the added benefits of motion blur reduction there which should certainly be explored. The screen is listed with a retail price of $399 USD from BenQ's online store, but we expect this to be a little lower once it's readily available. No word on worldwide release or pricing yet. 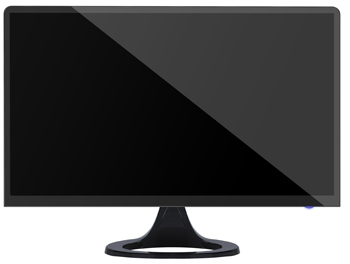 BenQ are set to launch a new 24" screen in their "ProGraphics" range, designed with soft-proofing in mind. The PG2401PT features an IPS panel, something which BenQ have adopted in a few screens recently in place of their favoured VA panel tech. The backlighting is based on the modern GB-LED units, as featured recently in the Dell U2413 for example. This allows for a wide gamut colour space offering 99% Adobe RGB, 100% CMYK and ~103% NTSC coverage. The screen offers 10-bit colour depth support as well, and a 14-bit 3D LUT for high levels of colour accuracy and reliable gradient reproduction. The screen is hardware programmable using a compatible colorimeter device, and ‘Palette Master’ software is also included that verifies calibrations against printing industry standard criteria. It also comes factory calibrated with a dE of <2, and the box includes a custom calibration report for each unit. There is also a uniformity compensation feature which is a nice extra too. Thankfully the OSD menu confirms the screen should offer an sRGB and Adobe RGB emulation mode as well, for those who don't want to work in the native wide gamut of the screen. The 24" AH-IPS panel offers a 16:10 aspect ratio, 1920 x 1200 resolution, 5ms G2G response time, 1000:1 contrast ratio, 250 cd/m2 brightness and 178/178 viewing angles. Connectivity wise there are DisplayPort, Mini DP, DVI-D, VGA, HDMI and a headphone jack. There are also 2 USB 3.0 ports at the side of the monitor, with the necessary upstream input found alongside the other ports at the back. The screen offers a full range of ergonomic adjustments with tilt, pivot, height and rotate options. There are built in ambient light and human motion sensors as well, part of their EyeCare initiative. The screen is also packaged with a hood for those who might need it. No word on whether this monitor will be flicker free or not, but given it is not specifically mentioned, this may be one of the screens which were already in development before the flicker free initiative really took form. No word on release date or pricing yet. We will update you when we know more! We had some hands on time with the PG2401PT yesterday. It's expected to be available later in the year, probably Q3 for the mass production. We should have a pre-release review once available. The AG coating was light as per other modern AH-IPS panels thankfully. The OSD had touch sensitive buttons and a nice looking new menu design and layout. There were scaling options for 1:1 pixel mapping, aspect ratio retention and "full". There are lots of settings for gamma and colour temperature, and loads of preset modes too, all of which carry factory calibrations apparently. Factory calibration report provided in the box too. There is a specific Adobe RGB and sRGB mode thankfully for emulation of smaller colour spaces. The hardware calibration feature works with BenQ's own software only which is co-produced with X-rite. It supports Windows and MAC OS thankfully, and can work with X-rites i1 Display Pro, i1 Pro and i1 Pro 2 devices. No support for ColorMunki or Spyder at the moment but we did feed back that it would be useful for a future update. Software looked thorough with plenty of options and features. The uniformity correction has options for on and off, but can be enabled in any mode including hardware calibration thankfully (unlike the Dell U series). Good range of ergonomic adjustments from the stand, interesting stand design, USB 3.0 ports and even an integrated 8-in-1 card reader on the left hand side. Screen is packaged with the hood which was of good quality, and it even comes with the little "hook" for the back to hang headphones (a la BenQ XL gaming series). This time the trim is in blue instead of red to distinguish the PG series from the XL series. The backlight is not flicker free, as there were some concerns around colour rendering when using a DC circuit, so given the target market PWM is used. Didn't have a chance to test response times or lag but those aren't the key concerns of this monitor at all. Announced at the end of May, the massive 31.5" IGZO technology display from Asus with 4k resolution has now appeared on some online retailers for pre-order. The monitor was put up for reservations through retailers such as Amazon, NewEgg, and TigerDirect with a price tag of $3,499 USD (approx €2,700 Euro, £2,292 GBP). The retailers all list 16 July as the expected release date. We are in touch with Asus about sourcing a sample for review, so watch this space.